There are films that never lose their emotional wallop, despite how many times you’ve seen them. Steel Magnolias, The Color Purple, Stella Dallas and An Affair To Remember come to mind. There is no element of surprise in the viewing; in fact the memorized dialogue and outcome are part of the pleasure. But the way in which the stories are crafted pull the viewer in for the punch. Of course there are reasons to revisit a dramatic film besides an opportunity to use tissues and visine. Films can tell us an awful lot about how we lived or thought. A film is fantasy of course, but it is a reflection of a director, screenwriter or producer’s viewpoint. Attitudes portrayed about gender, race, sexuality and religion are often an accurate reflection of the time. A film shot in the early 1970s will not only look very early 1970s but sound it too. Women might be referred to as “girls” or “honey,” bottoms might be patted. Generally, if non-white actors appear it’s to make a point. The storyline probably has nothing to do with any of these details, but the details are telling nonetheless. 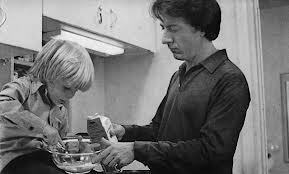 You might remember the film; Kramer vs Kramer. (For those who don’t; it was a cutting-edge tale of divorce and custody starring Dustin Hoffman and Meryl Streep, set in New York City.) The emotional wallop of the film doesn’t diminish with time. Much of what will rip you to shreds is the incredible performance of (8 year-old) Justin Henry. You’d have to be made of stone to not crumble at the raw hurt and anger on his face. Meryl Streep’s eyes do most of her talking. She has perhaps twenty lines and expresses pages and pages of dialogue with her eyes. The viewer understands everything about these people and their anguish. But there is also (now) a story on the periphery of that story. The year is 1979 and times were decidedly different. The family is middle class (daddy works in advertising.) They are educated people living in a two-bedroom high-rise apartment uptown. The child attends a neighborhood school and they frequent Central Park. Sounds rather timeless, no? It’s what you don’t see that is so telling. The family (before they weren’t one) is living comfortably on one salary. There is no car, there is no private school and there is no luxury. The child’s bedroom has been hand-painted with clouds by the creatively frustrated mother. (In 1979 this was considered somewhat decadent.) However, there is no Pottery Barn kid’s furniture or matching bedding and window treatment. There are some books, some toys, and later a framed photo of mommy. The chaos that ensues with mommy’s departure is linked to the time period. There are no babysitters or nannies on call or even in existence. (Nannies were still for the posh or the British.) Daddy must master grocery shopping and food preparation as take-away was not ubiquitous and children did not dine out. Luckily for daddy there are no play-dates (there is only play) and there are no enrichment programs or team sports for a first-grader.